If you would have told me 10 years ago that I would one day be blogging about how much I loved pasta salad, I would’ve called you crazy. The truth is that I have not always liked pasta salad. Over the last few years I have noticed my tastebuds changing rapidly and find myself enjoying foods I once wouldn’t consider. I’ve made it a point in my adult life to keep trying new flavors and recipes to see what tastes good. 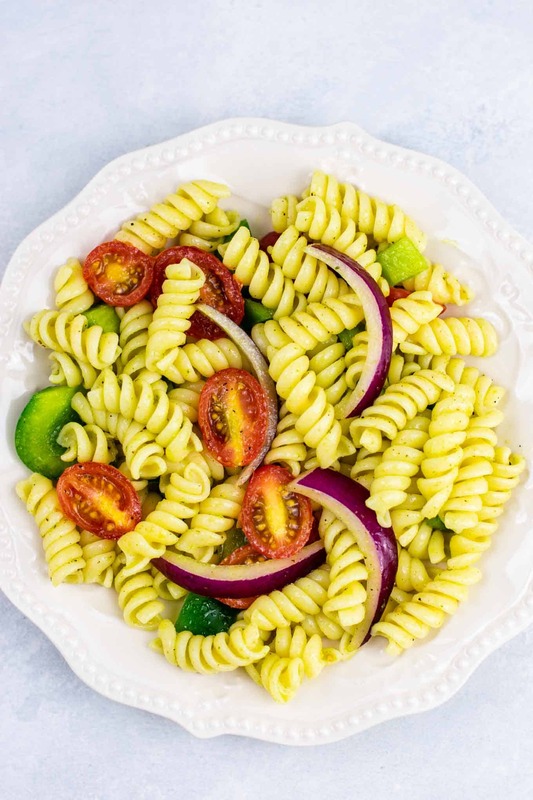 I made this vegan pasta salad recipe this week and I was in love! 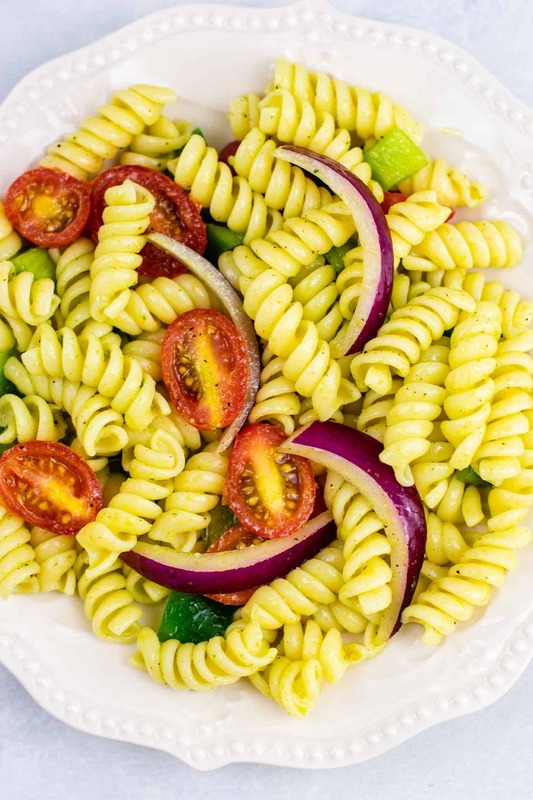 Fresh veggies with rotini noodles and a flavorful olive oil dressing packed full of flavor. I was eating it straight from the mixing spoon! I can’t wait to share this delicious easy recipe with you. First, start cooking your rotini noodles. You will cook them to al dente, then immediately drain and rinse with cold water. We want them to keep that great texture without getting too mushy. Rinse them well and stir around so that the cold water reaches all of the noodles. You should be able to touch the noodles without them being too hot. JUST TAKE ME TO THE VEGAN PASTA SALAD RECIPE! 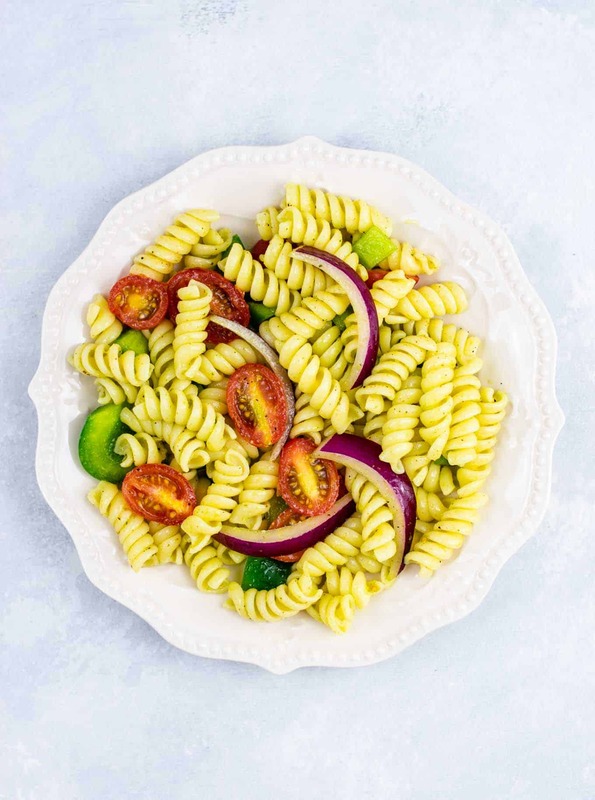 If you would rather skip my tips and tricks and similar recipe ideas – and get straight to this vegan pasta salad recipe – just scroll to the bottom of the page where you can find the printable recipe card with instructions, ingredients, and measurements. Enjoy! 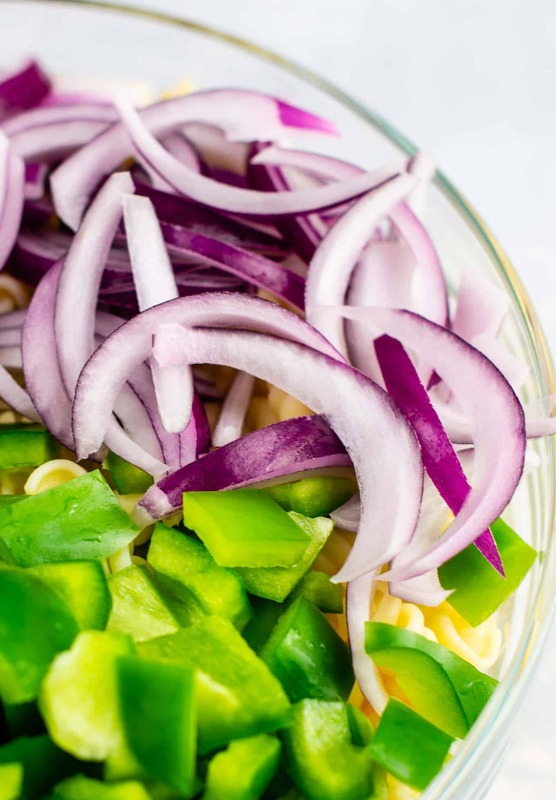 While the rotini is cooking, chop up your fresh veggies! For my vegan pasta salad, I used sliced red onion, halved cherry tomatoes, and diced crunchy green bell pepper. If you are into olives, those would be a good addition here too. Next up: it’s time to make the dressing. I used my magic bullet to blend my dressing up for ease of convenience. I just added the olive oil, fresh parsley, lemon juice, maple syrup, garlic, and onion powder and whirred it up until smooth. If you don’t want to use a blender, you can just finely chop the parsley and mince the garlic, then mix all ingredients with a whisk. 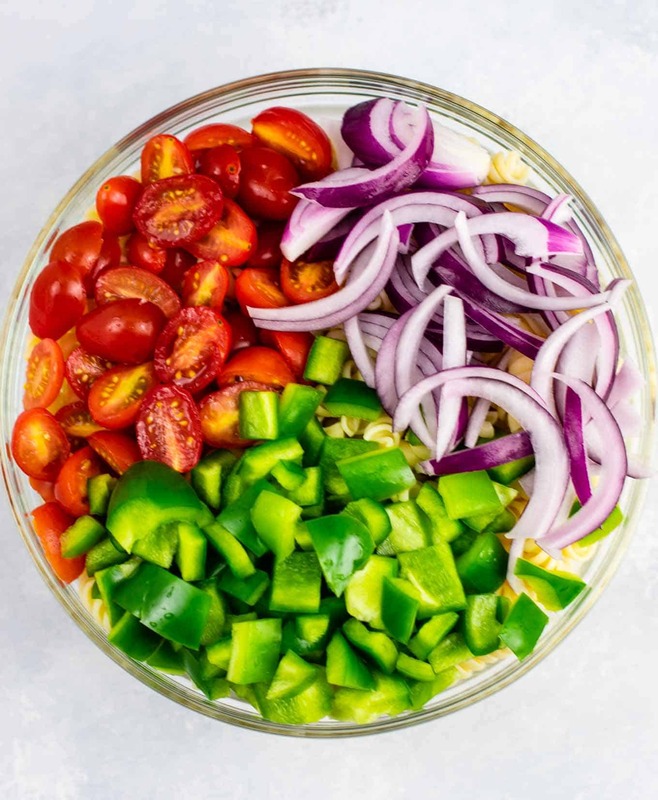 Once your dressing is ready, stir together the cooled pasta (no need to chill it first, just rinse with cold water), dressing, and fresh veggies. Stir well until all the pasta and veggies are coated in that yummy dressing. Salt and pepper to taste. Don’t be shy! Salt brings out all of the flavors, so add it to your taste. I added enough salt until I took a bite and the flavor wowed me. That’s when I knew it was perfect! 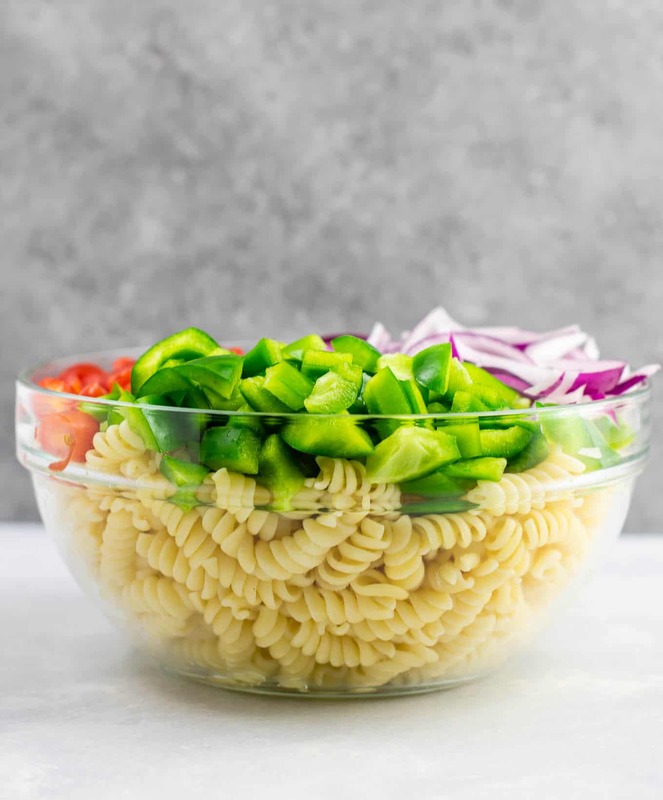 My number one tip for the best pasta salad is to plan to make it the same day you serve it. 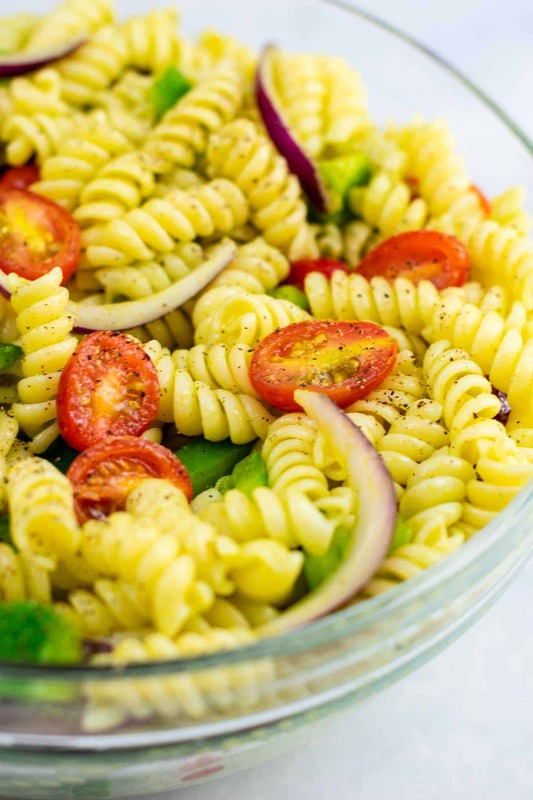 Ideally, you won’t refrigerate the pasta salad before eating. 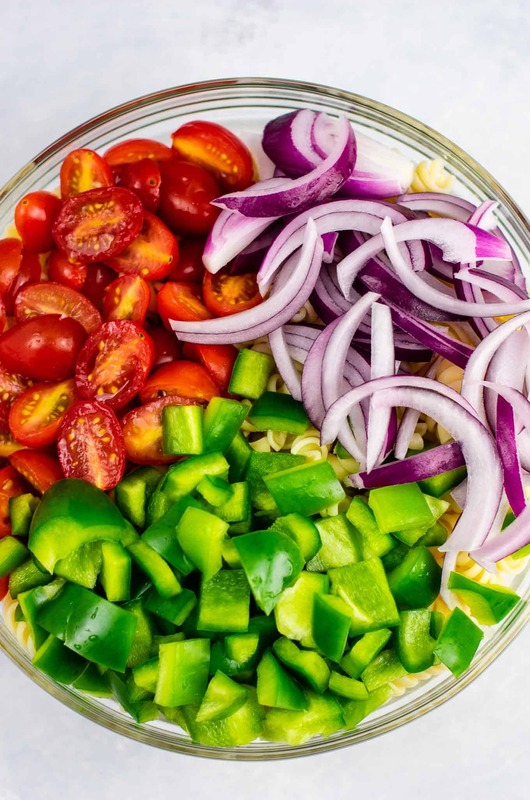 The reason for this is that once you put that pasta salad in the fridge, the noodles will soak up the dressing and become dry. If served fresh, the noodles will be coated in that buttery olive oil dressing and taste heavenly. I suggest planning to make this and serving it right away for optimal flavor! While you can keep leftovers in the fridge, keep in mind that it’s best fresh. This would be a great recipe to make as a side dish for lunch or a potluck! 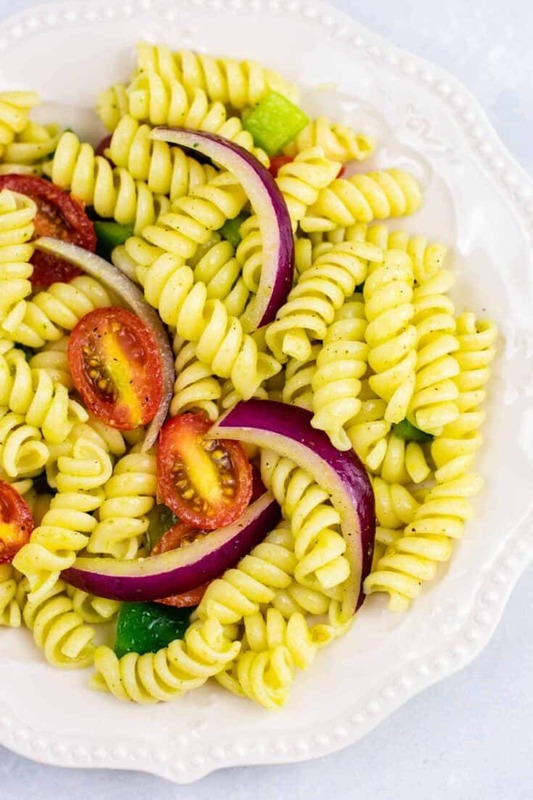 Here are a few recipes that would be delicious paired with this vegan pasta salad! 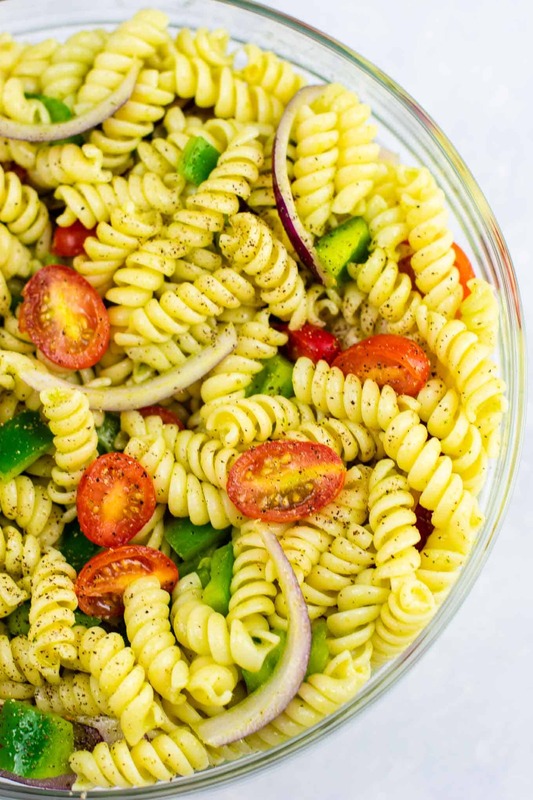 Like most pasta salads, this recipe is best served fresh and will dry out once chilled in the fridge. I love this! So vibrant and fresh, and perfect for lunchboxes too. Can’t wait to try it out!